Some assembly required. Well, he is an Avenger. Oh we knew how to have fun back in the day! Truth be told, I had entirely forgotten that. This isn’t a comic that sticks in my mind, but I obviously shelled out an extortionate 25p to buy it and subsequent issues. The Marvel Revolutionary Hulk Comic had vanished up its own wazoo. The home grown strips had all but vanished and the Green Goliath had vanished from whatever they were calling Spider-Man that week. In 1982, somebody at Marvel UK decided the time was ripe to resurrect The Incredible Hulk. This might have been prompted by a rerun of the Bixby-Ferringo tv series. There is a liberal deployment of Lou pics through the comic. It starts with a reprint of a Stan Lee- Herb Trimpe issue where the Hulk runs afoul of Maximus the Mad in South America. There is half a page of Hulk the Menace and a bit of What If Wolverine had killed the Hulk?. The “free colour poster” was a centrespread of the Brian Bolland Hulk illustration used on Hulk Comic #1. But the cover promises “A great free gift”. What could that have been? 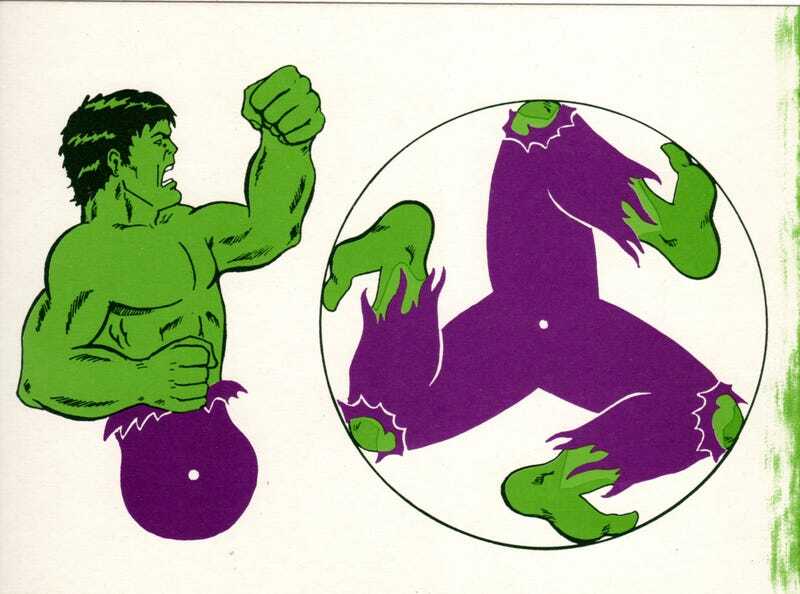 That was the “Roll-a-run” Hulk kit. And you can join in the fun if you print out the top image of a piece of card. Cut out the figure and the wheel, attach it with a split pin, maybe stick on a lollystick as a handle (Wall’s made a Hulk fruit flavoured ice lolly with green candy sprinkles around this time). Then you can roll away for hours (uh, minutes) of Gamma powered joy! Do you know I have never done this.